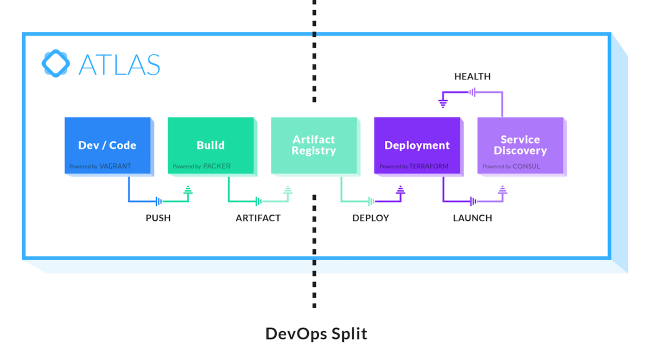 On the heels of closing a $10 million Series A funding, previously stealthy open source DevOps toolkit provider, HashiCorp, unveiled its new commercial offering that connects all of their open source products. Called Atlas, the new service provides a single place for developing, building, deploying and monitoring distributed applications. The funding was led by Mayfield with participation from GGV Capital and True Ventures. HashiCorp’s family of five products includes Vagrant for creating light-weight development environments; Packer for creating identical machine images on multiple platforms; Serf for cluster management; Consul for service discovery and configuration and Terraform for building, combining and launching infrastructure. The company’s roots go back to the college days of co-founders Mitchell Hashimoto and Armon Dadgar at the University of Washington. They began with a big idea to create what they called a cockpit for building, deploying and managing distributed applications. However, being students who were obligated to do things like take classes, they soon realized the problem was probably too big to solve right then, and they shelved the idea. But they didn’t forget about it, and while they got their education the problem still loomed in their imagination. After graduating and getting jobs, Hashimoto and Dadgar reunited in 2012 and launched HashiCorp . They decided to break their big problem down into smaller, more manageable pieces and eventually built the five open source tools currently on offer. In fact, they found as they developed each one, the community let them know about adjacent problems and they layered on each new tool to address a different need. For Robin Vasan from lead investor Mayfield, the popularity of the open source pieces with developers was a good sign. Atlas, the product they are announcing today is a cloud service that stitches the five open source products into a single interface. Hashimoto tells me while it’s possible to do this without Atlas, it takes a considerable engineering effort and they have done the work for their customers with this product. “We have created a single system and dashboard that strings these products together into one solution,” he explained. And he says that gives developers and IT operations ( a combination also known as DevOps) the tools to get a broad view of the DevOps workflow as applications move through the development, deployment and management processes. Hashimoto points out that the service works across a variety of systems including those running on Windows or Linux or public and private cloud solutions such as VMware, Amazon Web Services or OpenStack. It works on physical servers, containers (like Docker) and with Chef and Puppet. The idea is to give you visibility across all of that throughout the development lifecycle, regardless of the tools you are using. “We’ve built Atlas to allow companies to focus on what they want to do and not deal with all of the complexity of getting from building to production,” Hashimoto explained.